What is the SEQUENTIAL Tasting chart? It's not another flavor wheel. It’s the next step in tasting note evolution. It’s deductive like Sherlock Holmes. You’ll be able to pick up any glass of whiskey, glance at the color, take a couple whiffs, a sip, and know things like age, region, and base grain all without ever having seen the whiskey before. The smallest of clues will unveil a host of information to your keen senses. Of course, any skill worth having takes time and practice to acquire. But something tells me you won’t mind. Are you ready to get more from your golden dram? We’ve made the chart free as our gift to you. 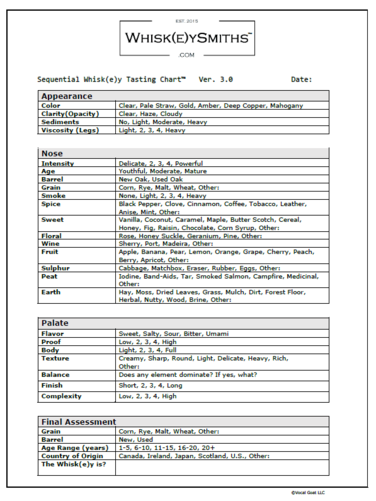 Fill out the form below and get helpful Whisk(e)y Wednesday articles and your Sequential Tasting Chart™ (sometimes called a tasting grid) delivered right to your inbox! Whiskey is a gift. Learn more. Enjoy better. Congratulations! Your Whiskey Tasting Chart is flying towards your inbox as you read this. Want the gear whiskey sommeliers use? Shop here!